After coming up with great ideas, the next challenge is figuring out the best way to make them happen. This exercise is one of many types of “scenario” games which can be used to test ideas and try out different approaches to bring them to life. When having discussions about how to do something, we often get overwhelmed by all of the variables and reasons why it might not work, and can end up working in circles questioning our assumptions before we’ve even tested the idea. Setting stakes in the ground can clear the space we need to get down to it and discuss how to try something new under more specific circumstances…and doing it across groups helps to think through very different ways of doing the same thing. OBJECT of the GAME: To get groups to model a business approach based on several extreme scenarios, using two to three variables. WHEN to USE: After a brainstorming or prioritization exercise where a new idea, model, business or product has been selected. In advance, select two or three variables which would impact how your idea would be implemented. 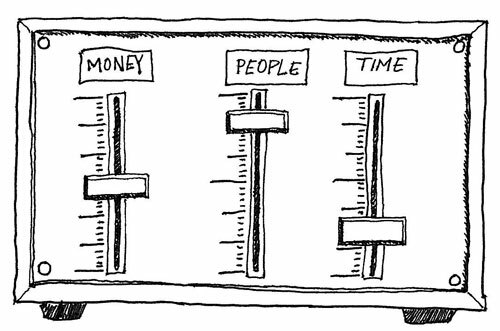 If it’s a project, it could be “money, people and time”. It’s helpful to set some context for your variables. Money could range from $10k to unlimited funds, for example, while time might be “done in 3 months” to “as much time as you need”. Working with a number of groups in parallel, assign one scenario to each group. Ask the groups to come up with an approach based on that scenario. Instruct the groups to take the scenario as a given – don’t say it’s impossible in three months; tell us how you’d do it. Allow the groups to all share their work with the others, outlining their approach as well as explaining the tradeoffs and shortcomings based on the constraints of their scenario. Debrief as a large group to identify ideas that people agree should go forward, and which variables and constraints the group believes to be non-negotiable. FACILITATOR NOTES: Getting the groups to produce something for the report out helps them crystallize their thinking and gives the broader group a something tangible to work with when debriefing. Getting them to draw models or doodles to illustrate their ideas can help get them focused on delivering a product. While it’s enjoyable and worthwhile to discuss the ideas behind Gamestorming, it’s more useful to experience them. The image below represents output from a visual-thinking game that you can “play” with your employees. Caution: Adults have a tendency to link Show and Tell to child’s play. This is a learning faux pas. It’s right up there with underestimating the value of doodling. And now we know what’s wrong with that: Take Note: Doodling can Help Memory. OBJECT of the GAME: To get a deeper understanding of stakeholders’ perspectives on anything—a new project, an organizational restructuring, a shift in the company’s vision or team dynamic, etc. A few days in advance of a meeting, ask employees to bring an artifact for Show and Tell. The instructions are to bring something that, from their perspective, is representative of the topic at hand. If possible, tell them to keep the item hidden until it’s their turn to show it at the meeting. In a white space visible to everyone, write the name of the game and the topic. If you wish, draw a picture of either. When everyone is assembled with their show piece, ask for volunteers to stand up and show first. Pay close attention to each employee’s story of why she thought an item represented or reminded her of the topic. Listen for similarities, dif­ferences, and emotional descriptions of the item. Write each of these contributions in the white space and draw a simple visual of the item the person brought next to her comments. Summarize what you’ve captured in the white space and let the group absorb any shared themes of excitement, doubt or concern. Ask follow-up questions about the content to generate further conversation. WINNING STRATEGY: Show and Tell taps into the power of metaphors to reveal players’ underlying assumptions and associations around a topic. If you hear a string of items that are described in concerned or fearful terms, that’s likely a signal that the employees’ needs aren’t being met in some way. As the team lead, encourage and applaud honesty during the stories and write down every point an employee makes that seems important to him or her. Keep the rest of the group quiet while someone is showing and telling. As the group facilitator, if you feel intimidated by drawing a representation of a show item in the white space, get through it: attempt to draw it anyway and let the group tease you about your efforts. Show and Tell can be a vulnerable activity for employees—particularly the introverted type—so show some team spirit by being vulnerable in your leadership role. Fuzzy goals, originally uploaded by dgray_xplane. In industrial work, we want to manage work for consistent, repeatable, predictable results. Industrial goals are best when they are specific and quantifiable. But in knowledge work we need to manage for creativity – in effect, we don’t want predictability so much as breakthrough ideas, which are inherently unpredictable. For knowledge work we need our goals to be fuzzy. In any creative endeavor, the goal is not to incrementally improve on the past but to generate something new. New, by definition, means “not seen before.” So if a team wants to truly create, there is simply no way to precisely define the goal in advance, because there are too many unknowns. Embarking on this kind of project is akin to a voyage of discovery: you may begin your journey by searching for a route to India, but you might find something completely different, but even more valuable. At the beginning of such a project, the unknowns outweigh the knowns, and the biggest problem is finding the right questions to ask. In a paper titled Radical innovation: crossing boundaries with interdisciplinary teams, Cambridge researcher Alan Blackwell and colleagues identified something they called the “pole-star vision” as an essential element of successful innovation. 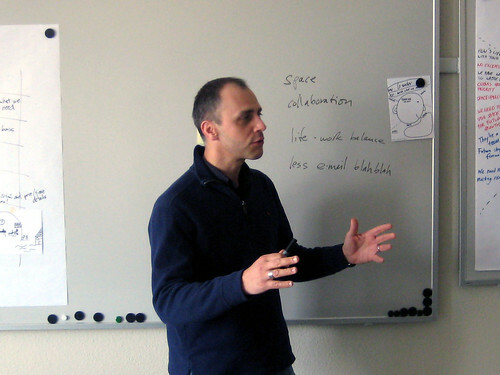 A pole-star vision is one in which the goal “motivates the general direction of their work, without blinding the team to opportunities along the journey.” One leader described his approach as “sideways management.” Important factors identified by the Cambridge research team include the balance between focus and serendipity and coordinating team goals and the goals of individual collaborators. A fuzzy goal straddles the space between two contradictory criteria: At one end of the spectrum is the clear, specific, quantifiable goal, such as 1,000 units or $1,000. At the other end is the goal that is so vague as to be, in practice, impossible to achieve; for example, peace on earth or a theory of everything. While these kinds of goals may be noble, and even theoretically achievable, they lack sufficient definition to focus the creative activity. Fuzzy goals must give a team a sense of direction and purpose while leaving team members free to follow their intuition. What is the optimal level of fuzziness? 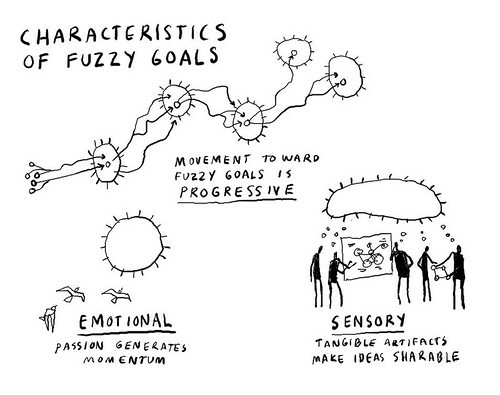 To define a fuzzy goal you need a certain amount of ESP: Fuzzy goals are Emotional, Sensory and Progressive. Emotional: Fuzzy goals must be aligned with people’s passion and energy for the project. It’s this passion and energy that gives creative projects their momentum, therefore fuzzy goals must have a compelling emotional component. Sensory: The more tangible you can make a goal, the easier it is to share it with others. Sketches and crude physical models help to bring form to ideas that might otherwise be too vague to grasp. You may be able to visualize the goal itself, or you may be able to visualize an effect of the goal, such as a customer experience. Either way, before a goal can be shared it needs to be made explicit in some way. Progressive: Fuzzy goals are not static; they change over time. This is because, when you begin to move toward a fuzzy goal, you don’t know what you don’t know. The process of moving toward the goal is also a learning process, sometimes called successive approximation. As the team learns, the goals may change, so it’s important to stop every once in awhile and look around. Fuzzy goals must be adjusted, and sometimes completely changed, based on what you learn as you go. Innovative teams need to navigate ambiguous, uncertain and often complex information spaces. What is unknown usually far outweighs what is known. In many ways it’s a journey in the fog. The case studies haven’t been written yet and there are no examples of where it’s been done successfully before. Voyages of discovery involve greater risks and more failures along the way than other endeavors. But the rewards are worth it. In a 1936 “thought experiment,” Alan Turing described a hypothetical machine that could perform any calculation. Fifteen years later the first mass-produced computer was delivered to the U.S. Census Bureau. In 1969 the first link on the internet – then called ARPANET – was established, between UCLA and Stanford. In the 1970’s, the introduction of the microprocessor made possible the personal computer. Computing power has approximately doubled every two years since 1960, a trend which continues today and is not expected to change until 2015 or later. Internet traffic is growing at a similar rate, with no signs of diminishing any time soon. In combination, personal computers and the internet that links them together have transformed society as profoundly as industrialization did. We’re now in the process of digitizing everything; wrapping our physical world with a digital layer of information which parallels and reflects our own. We want to know everything we can think of about everything we can think of. Our world is awhirl with digital information. In a digital world, the product or service has no physical substance. There are no distribution costs. A single prototype can generate an infinite number of copies at no cost. And since the products and services are so different, the environment around them becomes unstable; as the digital layer interacts with the physical layer, everything in the ecosystem is up for grabs. Suddenly new products become possible and established ones become obsolete overnight. The rules of creation and distribution are changing, and it’s driving a massive shift: As the software used to create new products becomes cheaper and easier to use, and as internet distribution models emerge, the barriers that keep individuals and small teams from competing with mega-corporations are melting away. Industries are falling like dominoes. The first to feel the blow were publishers, with the desktop-publishing revolution of the 80’s, blogging in the 90’s, and now the Kindle and Sony Reader. Second came music, when software like GarageBand gave artists a desktop recording studio and distribution channels like iTunes gave them access to global markets. Next will be film and software, followed soon by physical products. Products, you say? Yes, soon we will see the equivalent of the “Garage band” in product design. It’s already begun. 3-D modeling software is getting cheaper and easier to use all the time. Today, you can take a 3-D computer file and deliver it directly to an overseas factory for production. The trend is toward the small team, or the company of one, where creativity and adaptiveness trump money and resources, which are increasingly becoming commodities, losing the power they once had as barriers to competition. Hard to believe? The digital revolution is rife with examples. Most of today’s dominant information-driven companies started with little or no startup capital. The first Apple computers were hand-built in a garage. Microsoft was started by a college dropout. Oracle was started by another college dropout, with $2,000 of his own money. Google and Yahoo were started by college students. EBay was started by a 28-year-old computer programmer on a holiday weekend. Amazon.com was started in a garage. Numerous other successful information-driven companies were started by young people on a nickel. The next wave is already underway with companies like Facebook, started by a college sophomore, now making $500 million a year and growing. Individuals, working alone, now can design and command workflows that requires massive financial resources only a few years ago. Given enough motivation, an individual with modest resources can now make a feature-length film, publish a hardcover book, start a TV or radio station, outsource manufacturing of sophisticated products, and sell products to a global marketplace. The bottom line is that success in a knowledge economy requires different thinking, different aptitudes, and a different approach to work. The focus of a knowledge-driven company must be on creativity and systems thinking rather than planning and efficiency. In a world where manufacturing and distribution are commodities, the only thing that can differentiate a product or service is creativity and customer relationships. This is soft stuff – it’s not quantifiable or easily measured, and it’s not the stuff that business schools are good at teaching. But we need to get start getting good at it.